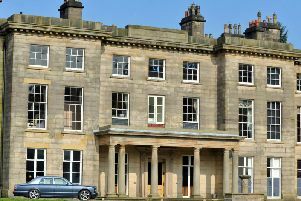 Facing towards the Fylde Coast, a Lancashire mansion on the market for a penny-busting £1.35m is taking the aphorism 'two is better than one' to a whole new level with a third story on top of (again, quite literally) the more archetypal two. And as any musketeer worth his gunpowder will tell you, three is better than two. As established, Harbour Home has three-storeys, and - making the most of its decadent exhibition of space - immediately opens into an airy reception hall with ceramic flooring, bespoke maple spiral staircases, and a galleried landing over which hangs a chandelier light with LED spotlight. Can I get an "ooh, la la" straight off the bat? Complete with inset spotlights to add that dash of Hollywood to your ascent, the staircase really is the feature of the home; one suspects a fair few maples made the ultimate sacrifice rather willingly knowing what a classy bit of stair-ware they made - they probably get almost as much natural light now, too, what with the home's bright feel. A picture of space-age reflections and highfalutin refractions, the home's kitchen not only comes with an Aga and a very vibrant colour scheme to inspire a few funky dishes, but with a heady range of fancy appliances and ample dining space around the central island in which to enjoy anything you rustle up as well. Through to the property's vast living room, where await a hole-in-the-wall gas fire, a series of double-glazed sash windows, and a tele-watcher's dream: a built-in unit with open display and base units with yet more inset spotlights - high-tech, high-quality, high-everything. Perfect for those who like to leave their most glute-straining stair-climbing for the gym, the home's truly huge master bedroom is happily located on the first floor rather than on the thigh-testing second, providing fitted gloss wardrobes and a gorgeous open-plan en suite complete with underfloor heating and a luxury Roca bathroom set - a dream for those comfortable enough to use the facilities within full view of your loved ones still dozing in bed. Another set of spiral stairs once again elevate you to another sprawling warren of luxury living including a balcony with modern wrought iron balustrade offering some splendid views. To go with the views is another bedroom with another en suite boasting a double shower cubicle and charmingly-named "splash areas". Take from that what you shall.